Expired 3mo ago . Last validated 5mo ago . Used 78 times. Ilianny Castellanos Online Only Coupon: Valid for online ship-to-home orders. Offer does not apply to purchase of batteries; overweight items such as engines and transmissions; oversized items such as large car top carriers; performance carburetors such as Edelbrock, Holley and Proform; any Magnaflow, Airaid, Air Lift, Covercraft, Extang, MSD and Husky items; items not available for ship to home delivery. Offers valid on regular priced merchandise only and do not include any other discounts or special offers. 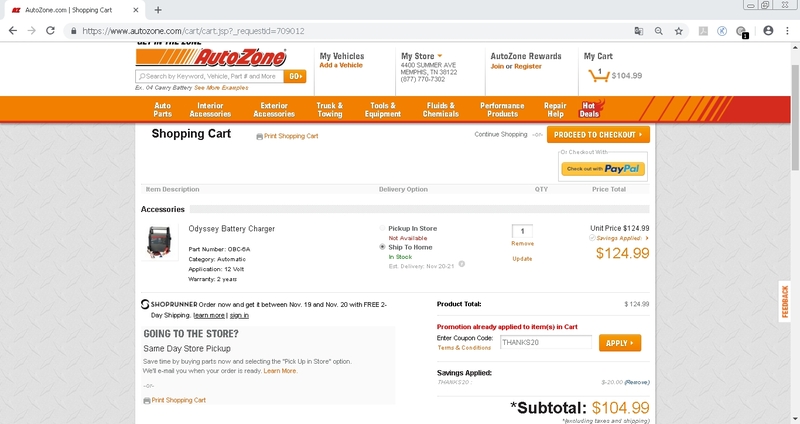 Online deals issued by AutoZone are only valid for Ship to Home orders placed on AutoZone.com by the expiration date. Certain product categories or types are not eligible for discount. Gift card purchases, taxes and core charges excluded. Coupon may not be distributed via Internet sites. Not valid with any other offer or discount. Limit one coupon per customer. No adjustments to prior purchases. Items returned will only receive credit for the discounted price paid for the item. AutoZone reserves the right to cancel, modify or deactivate a coupon at its discretion. Coupon usage terms and conditions are subject to change at any time without prior written notice from AutoZone. Any fraudulent or unauthorized use or validations will void this offer. Coupon has no cash value and may not be redeemed for cash. Void where prohibited by law. You will receive a digital promotional AutoZone gift card delivered to the email address provided with this order within 72 hours after being charged for your last item. In the event a digital promotional AutoZone gift card cannot be sent then a physical promotional AutoZone gift card will be sent separately from order within 4-6 weeks of order submission to the billing address.